Oh my! I never thought I'd pull a disappearing act for this long. I've been trying to get a proposal out the door, but nothing is worse than changing your mind about something at the last minute. I'm almost done and hopefully the effort will be worth it in the end. 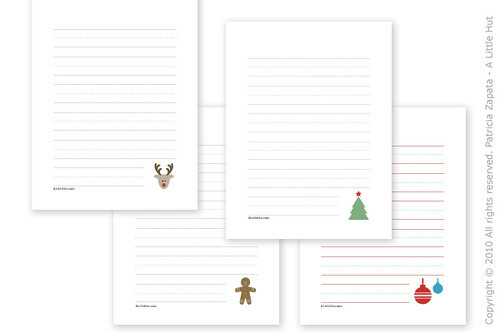 In the meantime, upon several requests, I decided to once again pull out the holiday lined printables for kids. Because of my limited time, I've 'recycled' some of my own images (hope you don't mind). I'm offering two versions—one is just like the ones I've posted previously and the other is in black and white. 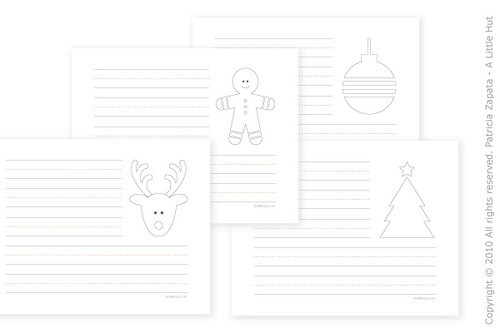 The black and white version has illustrations in outlines so that your little ones can color (while giving you an itty bitty slice of time to wrap gifts? read?—maybe?—or is that coming from a mom + wishful thinking?). 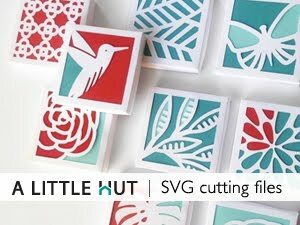 I hope you like them and that the kids have fun working on them. Can you believe there are only 12 days until Christmas? I can't.